To resolve the efficacies of antibacterial, antifungal, and antioxidant activities of aqueous leaf extract of Ocimum basilicum mediated biosynthesis of silver nanoparticles (Ag-NPs). Aqueous and synthesized Ag-NPs were tested by disc diffusion method against the bacterial and fungal pathogens. Antioxidant activity of synthesized Ag-NPs and aqueous plant extract were determined. The scavenging radicals were estimated by DPPH method. The synthesized Ag-NPs were characterized by XRD, FT-IR, FESEM and EDX. XRD peaks at 2θ values of 27.6°, 32.2°, 38.16°, and 46.04° representing the (110), (111), (121), and (200). FT-IR absorption peak located at 2910 cm-1 are due to C–H stretch of alkenes and a peak at 1669 cm-1 due to -C=C- band of alkenes and a peak at 1614 cm-1 is assigned to N-H bend of 1° amines and a peak at 1092 cm-1 due to C–N stretch of aliphatic amines and a peak at 875 cm-1 are due to C–H stretch of aromatics. TEM study reveals that most of the nanocrystals formed were spherical and polyphedral in shape antibiotics inhibition zones against the bacteria Staphylococcus aureus, Escherichia coli, Klebselia pneumonia, Proteus mirabilis, Proteus valgar is using the nanoparticles 8.9, 9.2, 7.8, 8.1, and 7.4 mm. 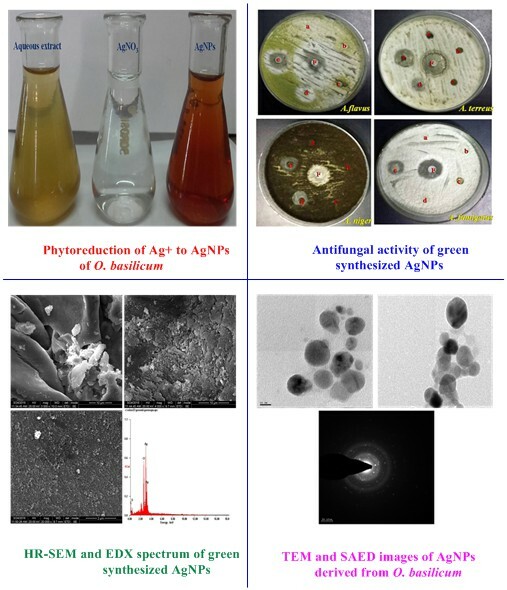 Ag-NPs exhibited strong antibacterial activity antifungal activity versus Asfergillus flavus, Asfergillus terreus, Asfergillus niger, Asfergillus fumigates exhibited a 7.8, 7.5, 6.9, and 7.1 mm inhibition zone using the Ag-NPs. 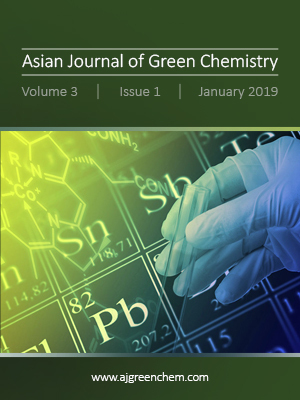 Green synthesized Ag-NPs provides a promising approach can satisfy the requirement of large-scale industrial production bearing the advantage of low-cost, eco-friendly and reproducible.